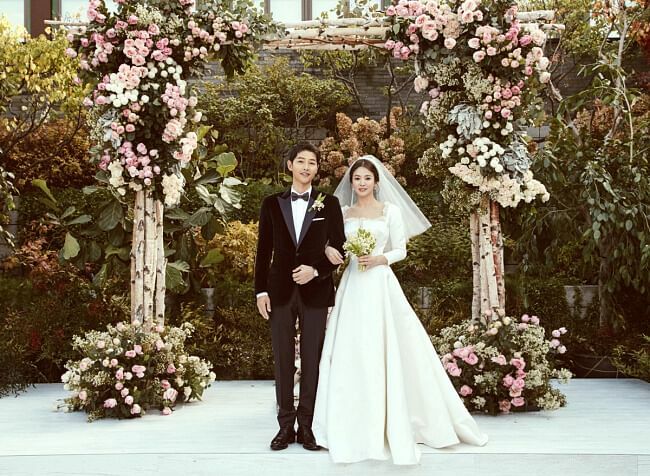 SEOUL (THE KOREA HERALD/ ASIA NEWS NETWORK) - Song Joong Ki and Song Hye Kyo tied the knot in a tightly guarded private ceremony that nevertheless was the target of heated media attention on Tuesday (Oct 31). 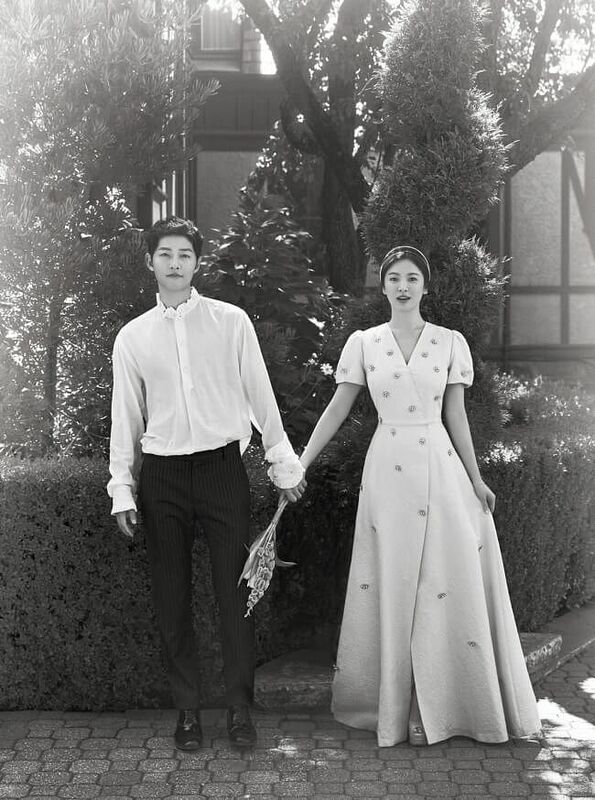 Their agencies Blossom Entertainment and UAA Entertainment released official wedding photos on Tuesday night after the celebrations. The photos show the newlywed couple during Tuesday’s outdoor ceremony at The Shilla Seoul’s Yeong Bin Gwan. Some black-and-white shots were also taken in San Francisco in September, ahead of the wedding. 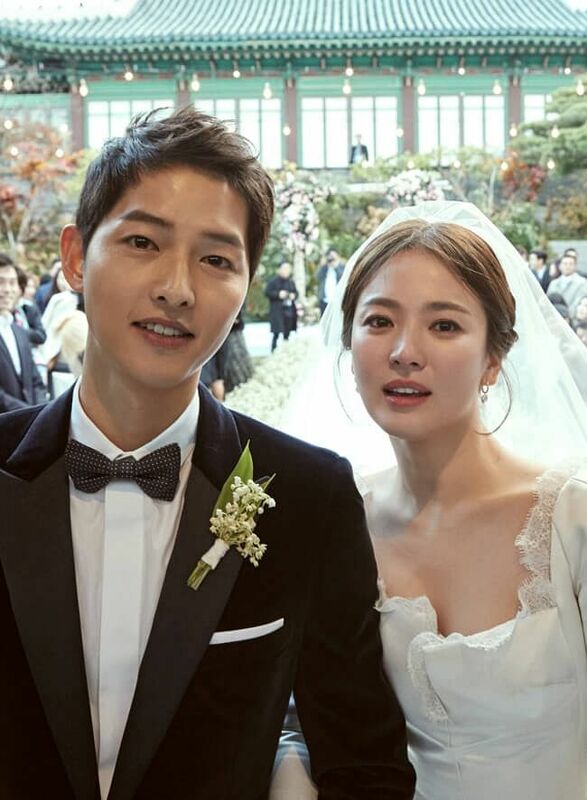 Although the couple did not give a customary nuptial press conference, the area around the wedding venue was overflowing with fans and reporters, added the report. Despite tight security, photos of the couple on a lawn - she, in a white low-cut gown, looking at him - also surfaced on Weibo. According to reports, the groom was in tears before he even said his vows. When it was the bride's turn, he smiled at her. She also shed tears during the ceremony, said reports. Her friend, musical actress Ock Joo Hyun, sang A Whole New World from the 1992 Disney animation Aladdin. The couple’s close friends, actors Lee Kwang Soo and Yoo Ah In, read out letters to them. Family and friends, numbering about 300, attended the ceremony.